Start your day right! 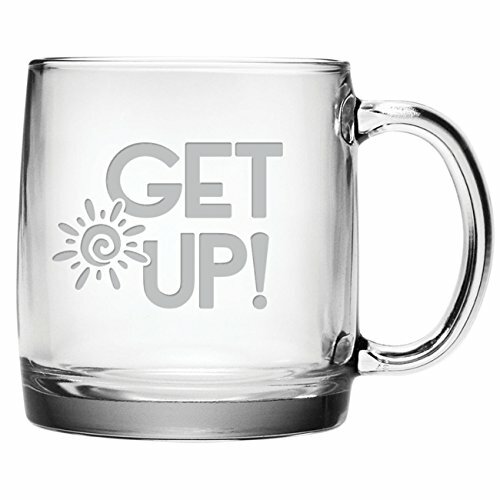 Enjoy your morning coffee, tea or juice in this attractive 13 ounce Nordic mug etched with a cheerful sun and a reminder that it's time to "Get UP!" A cappuccino or latte never looked better than when viewed through this clear glass mug. When your work is done, it's time to Get DOWN! Quench your thirst with a cold beer from this heavy glass 16 ounce pub mug etched with a moon symbol and the words "Get DOWN!" These are heavy, high quality glasses you will be proud to use or give to your best friends and family members. The etching is done by hand using a permanent sandblast process that creates a smooth, beautiful design. It will not come off in the dishwasher or everyday use. This is a set of two glass mugs - one suitable for juice or coffee, and one for beer. 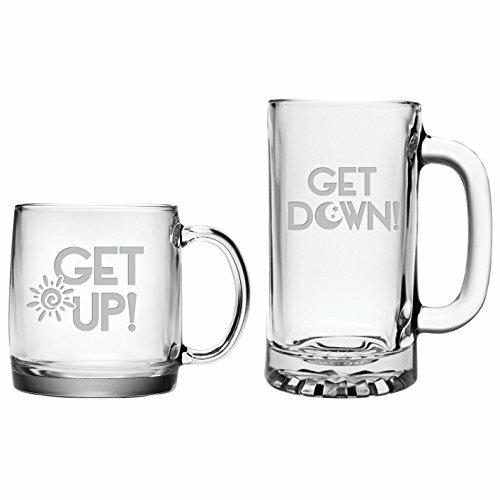 The coffee or juice mug is etched with an adorable sun symbol making it a pleasure to "Get UP!" It holds 13 ounces. It's 3.5" in diameter and 3.6" tall, with a heavy glass bottom and handle. 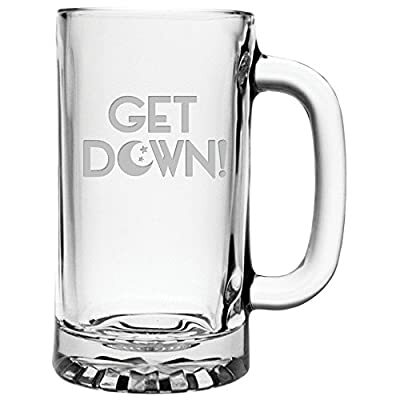 The beer mug is etched with "Get DOWN!" and a moon and stars. It holds a full pint (16 ounces). It's 3.1" in diameter and 6" tall, and also has a heavy glass bottom and handle. These glasses are elegant enough to make a wonderful gift, but they are sturdy, substantial and comfortable feeling in your hand. The coffee or juice mug is a high quality Arc International Nordic 13 oz. mug Made and Decorated in the USA. The beer mug is a high quality Libbey 5901 16 ounce beer mug - also Made and Decorated in the USA.